Successfully completed a whirlwind visit in Austin. It was damn hot (and still is). Thank you NY for cooling down for our return. We had lovely friends as tour guides and hosts and slept in the most comfortable bed I’ve ever experienced at the Intercontinental Hotel. Great food, drinks, music and super friendly Texas hospitality. Paintings will be showing in the windows of St. Vincent de Paul for the next two to three weeks. 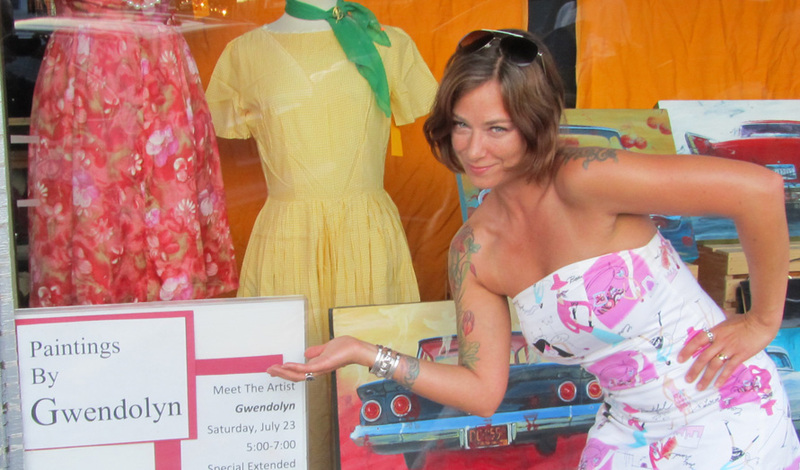 This vintage boutique and thrift store is located in “SoCo” (1327 South Congress Ave). The first Thursday in August (and every first Thursday of the month) is when SoCo’s big block party takes place so check out the party. Borderlands Texas Poetry Review summer issue will arrive in stores mid-August, and features 14 reproductions of my work. And at independent bookstores in Houston TX; Santa Fe NM; and Seattle WA. They will also be available in libraries across the country that subscribe, including the New York Public Library (main library, periodicals section) and the Rockefeller Library (Providence RI). If anyone wants copies now, please email borderlandspoetry@hotmail.com. I’d also like to thank Ramona Cearley who invited me to participate in this publication and was key in making this all happen.